A Brilliant 4 Star film. 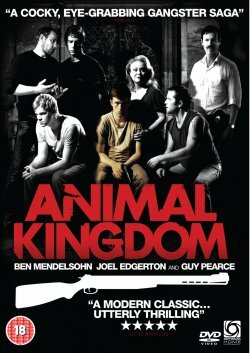 Animal Kingdom is a cracking film set in Australia where Joshua 'J' Cody (newcomer James Frecheville) a young man coming to terms with the premature death of his mother from an overdose, he also has to deal with the fact that there is no one else to look after him than his Grandmother. Janine 'smurf' Cody, (Jacki Weaver, Picnic at hanging rock 1975) plays the mother to three sons whom she knows are well beyond the right side of the law, but she dotes on them as if they were little angels. 'J' tries to fit in and is soon embroiled in the family ways, especially by the eldest son Andrew 'pope' Cody, ( Ben Mendelsohn, Knowing 2009) who is extremely paranoid that the police are out to kill him and the other brothers as there have been others shot by the police, headed by Det Nathan Leckie, (Guy Pearce, Memento 2000). His other brothers are Craig and Darren, ( Sullivan Stapelton, Darkness falls 2003 and Luke Edgerton, King Arthur 2004). There escapades soon lead to the green 'J' being held for questioning, which leads to Pope sliding further from normal thought processes. Guy doesn't appear as often as I would have thought but what he does is solid and delivered straight, but Mendelsohns' performance of the paranoid armed robber fuels this platform for the new Mr Frecheville and he delivers brilliantly a performance that lead to future thing no doubt. This is a gripping film done the Australian way and all the better for it I say, I believe if this had the Hollywood makeover it would lose it's edge. Making of. 1hr 9mins, with pre-post production commentaries. Interviews with the director and all the major players.